Mishpacha Magazine, August 16, 2017, The Money Trap, Too Good to Be True, (Reprinted with the permission of Mishpacha Magazine. © Mishpacha Magazine Inc. All rights reserved.). Mishpacha Magazine, July 19, 2017, The Money Trap, Mind Your Own Business (Reprinted with the permission of Mishpacha Magazine. © Mishpacha Magazine Inc. All rights reserved.). Mishpacha Magazine, April 26, 2017, A Run for Their Money, 10 Questions for Rabbi Moishe Kohn (Reprinted with the permission of Mishpacha Magazine. © Mishpacha Magazine Inc. All rights reserved.). Mishpacha Magazine, Family First, 24 August 2016, Advice Line, reply by Mrs. Batya Weinberg. (Reprinted with the permission of Mishpacha Magazine. © Mishpacha Magazine Inc. All rights reserved.). Mishpacha Magazine, June-August 2016, Teen Pages, an ongoing series of articles, Teen Voices on Money Matters (Reprinted with the permission of Mishpacha Magazine. © Mishpacha Magazine Inc. All rights reserved.). Mishpacha Magazine, 6 July 2016, letter to the editor, Shutting the Pipeline. Mishpacha Magazine, 22 June 2016, Shutting the Pipeline, (Reprinted with the permission of Mishpacha Magazine. © Mishpacha Magazine Inc. All rights reserved.). Mishpacha Magazine, Family First, 18 May 2016, Raise a Financial Wiz Kid (Reprinted with the permission of Mishpacha Magazine. © Mishpacha Magazine Inc. All rights reserved.). Mishpacha Magazine, Passover Edition, Kulmus, 2016, B’Mesilah Ha’olah L’calcala Nevona (in Hebrew). Yated Ne’eman, Passover Musaf Edition, Lechem Oni, 2016, Al HaCalcala (in Hebrew). Yated Ne’eman, 22 April 2016, letter to the editor, Helping Families. Yated Ne’eman, March 16, 2016, Purim: Expenditures According to Income, No More (in Hebrew). Twirl, Binah Magazine, Winter 2016, Money Talks. Mishpacha Magazine, Family First, 10 February 2016, No Nagging Necessary (Reprinted with the permission of Mishpacha Magazine. © Mishpacha Magazine Inc. All rights reserved.). HaModia, Education and Career Supplement, February 2016, Finances 101. 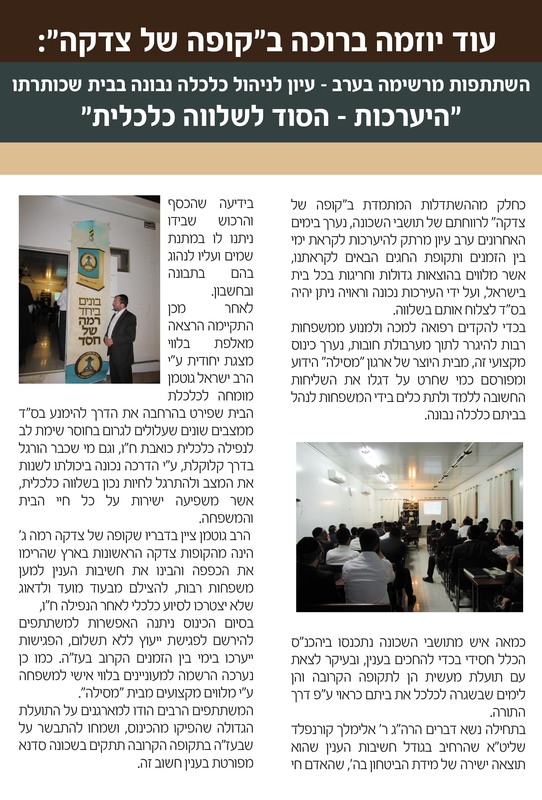 Mishpacha Magazine (Hebrew), November 12, 2015, Dovid Damen on Mesila. Ami Magazine, September 24, 2015, The Parnasah Crisis. Binah Magazine, , September 21, 2015, letter to the editor, Surviving September.